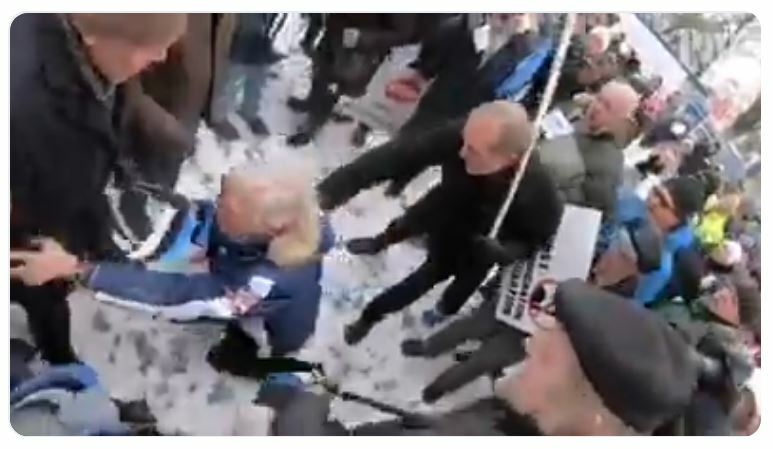 Estonian MEP (Greens) gets banged up after wrongfully grabbing microphone from anti-GCM protesters……. – The Tundra Tabloids……. Estonian MEP (Greens) gets banged up after wrongfully grabbing microphone from anti-GCM protesters……. According to a highly in-the-know (and well placed) Estonian contact of mine, Indrek Tarand is not a hapless politician assaulted by Estonian nationalists for simply trying to rebut their claims about the UN’s GCM agreement. According to my contact (who’s had direct contact with his bullying targets at school) he’s a (alleged) drunk and a bully all his life. The incident in question was, in fact, a major provocation operation, he violently grabbed the microphone and started shouting then got pushed away. Apparently Estonian papers are FULL of stories making him into a hero and a victim of grave violence by Estonian nationalists. My source says it’s quite incredible. I received news of the incident from a tweet in Finnish which claimed he is the acting Foreign Minister, but he’s nothing but a MEP (member of the fake EU parliament). According to my contact he’s never been a FM, but has been the chancellor of the Foreign Ministry who got fired for drunk driving and calling the minister a Russian a whore (it was Kristiina Ojuland). Tarand got elected to the European Parliament by 100K protest votes by denouncing all the parties, he’s now a Greens member. Previous Post Previous Post Daughter of Dinesh D’Souza interviews Laura Loomer protesting at Twitter building over unfair censoring of conservatives……. Next Post Next Post Caroline Glick: Europe Beats Iran’s War Drums…….